At long last, the first spring rifle is complete! I’m quite pleased with my first attempt at a VSR based SMLE, though there are a few tweaks I shall be making to production versions. I think in future versions I shall sit the action lower down in the stock to achieve a lower profile. Then I can add things like a charger bridge, maybe even splitting the back of the receiver for added authenticity. 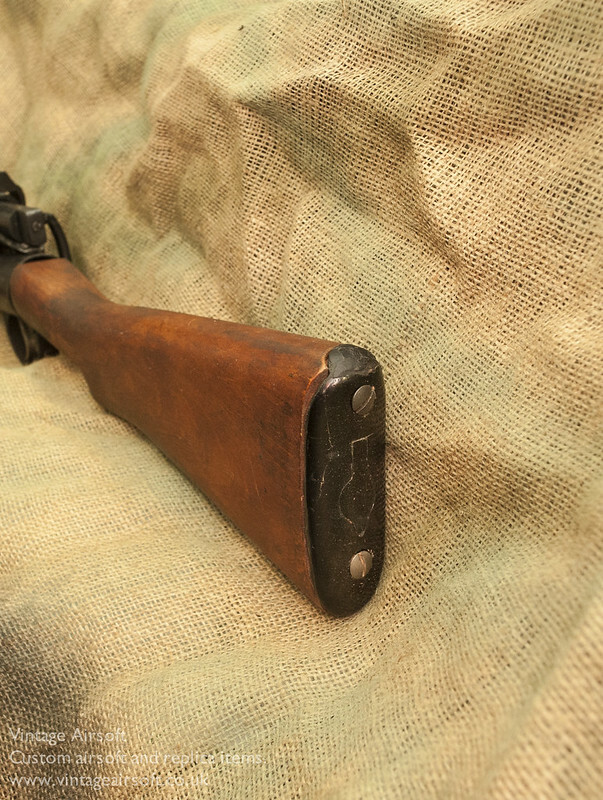 This example is using an original rear sight leaf. In future versions I hope to make reproductions to minimise the number of irreparably modified originals. The rear sight will also host the TDC hop adjustment mod, saving you a helpful upgrade. I may have to use No. 4 Enfield swivels unless I can find a way to reproduce these, swivels are becoming harder to come by. After the success of the 3D printed Sten MkV foresight, I have continued to use this technology here to create the outer barrel impression and foresight unit. The barrel has been trimmed down to fit. The VSR barrel is a little long so I removed it, cut and re-crowned it on the lathe. Here’s an important feature, I have lined the magazine well with steel which means magazine release should be consistent and not pinched by the wood. 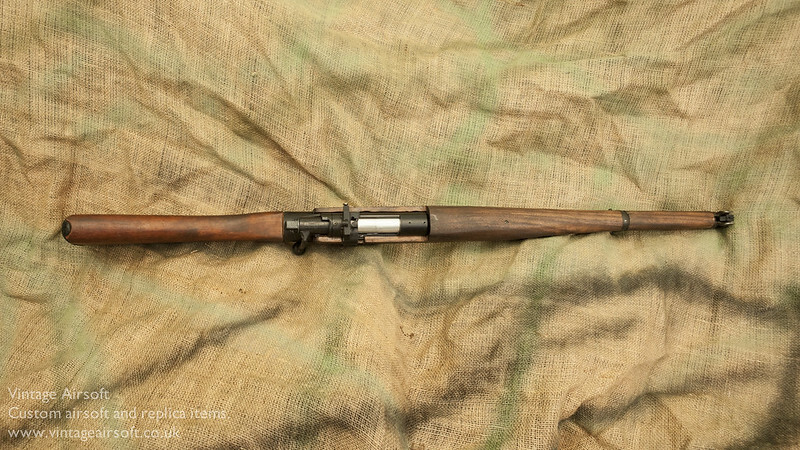 Other VSR Enfields don’t have this lining and I have seen magazines get stuck. There is a new design for this which I will use in the production versions to allow very fast magazine changes. The fake magazine is solid resin, painted to look right. There is no need to destroy a perfectly good magazine for this build! The original buttplate. I’m hoping to make reproduction ones for future versions. As this is an original buttstock you would still be able to fit an original if this happens. I’m hoping to improve the bolt handle and back of the bolt shape. However I am pleased with where it now sits, nice and authentic on the rear band you can achieve quite a good rate of fire. So, there are some changes to come for production but I’m very happy with this first go! 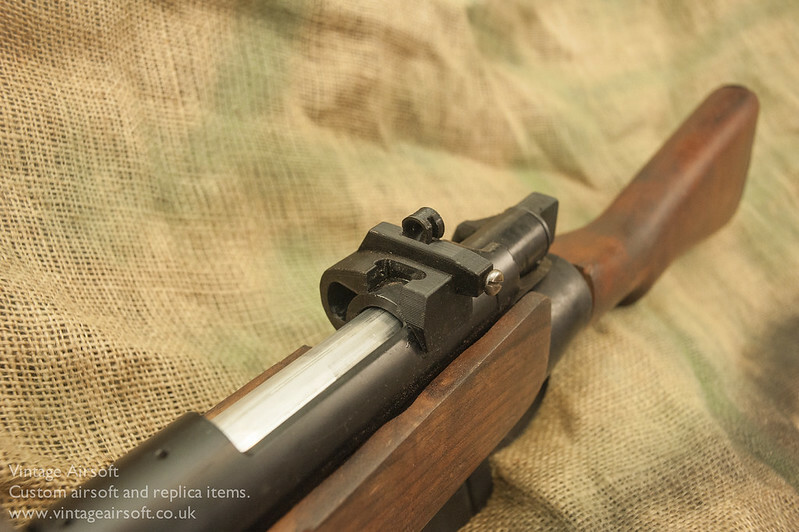 You can see the whole VSR SMLE build here and a potted history of Lee-Enfield development here. Don’t forget you can buy our complete products via Etsy. This will be available soon. I’ve had the mould sitting about from previous projects for SMLE magazines. I took a resin cast from this, cut it down to size and added some screws into the top to secure to the gun. I painted it with acrylics, which are great for getting metallic and weathered finishes. I’ve removed the rear band assembly to do some detailing and finishing work. Markings will be kept simple for this, no attempt to replicate the originals as they would require a very random set of stamps. As I’m replicating various Mks of firearm I can’t use the Mk system to denote changes in the designs of the airsoft versions as ‘SMLE No.1 MkIII MkI’ is a bit confusing! However I’m not going to stamp ‘V0.1’ onto this as it would look out of place, so it will be denoted as MkI. Confused yet? Yeah, me too. Now it’s clean and marked up, it’s heated up and into the oil it goes for that lovely, black satin finish. Finally, screwing on the buttplate and some last finishing touches before assembly…. The next steps were to permanently attach the buttstock and fit the top handguard. I cut the recess in the top guard to fit around the action and the barrel. I then cut space for the middle band. Once fitted this gave a rough idea of the sizes the furniture would need to be trimmed down to. In place, it all looks a bit square. Time to put it on the shave horse and put it to the drawknife. A bit of working later, the stock parts are rounded off and level. There is a slight bulge above the action as it is thicker much further down the rifle than on the real thing, but is isn’t too obvious. Once the rear sight is in place it should break up this bulge and make it almost imperceptible. For future models I may do a Top Dead Centre (TDC) modification, which will allow me to make the action a little shorter and reduce the bulge as with this mod there is no longer a large sliding part needing space at the front. I shall be making the rear sight from steel, laser cut. This will be easier than modifying an original as it has to fit around the spring receiver. It will however take an original sight leaf. At long last, the parts arrived! Welded together and smoothed out, next step is to attach the sight leaf. This will take an original Enfield sight or a copy I’m making. It will be oil finished for maximum wear resistance. Don’t forget to join Vintage Airsoft on Facebook to keep up to date with the latest build photos, history and classic firearms. 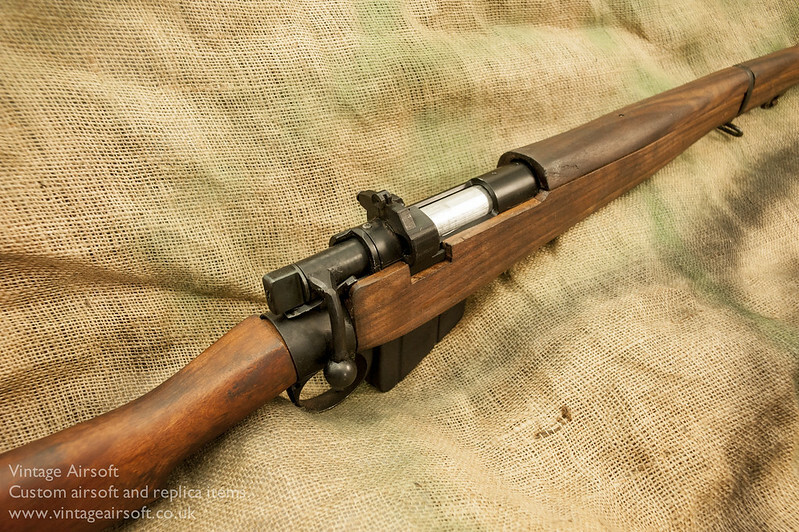 So, a few people have seen my GaSMLE project but don’t know I’ve also been working on a spring SMLE as well! 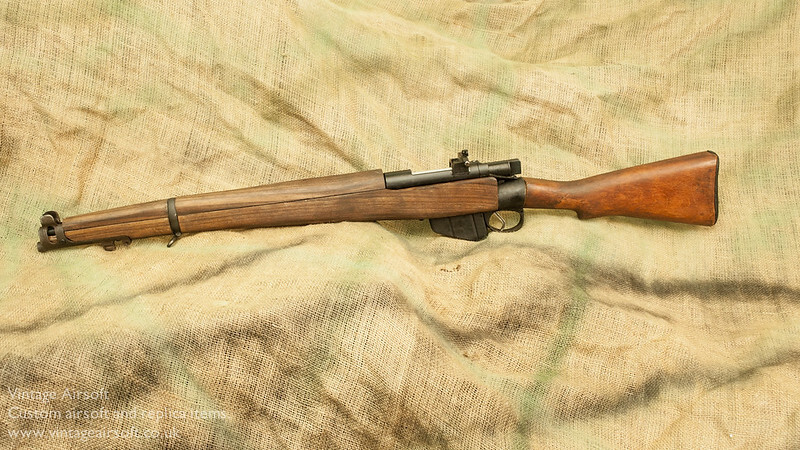 If you’re not familiar with the story of the Short Magazine Lee-Enfield check out the introduction I did on this series of rifles HERE. 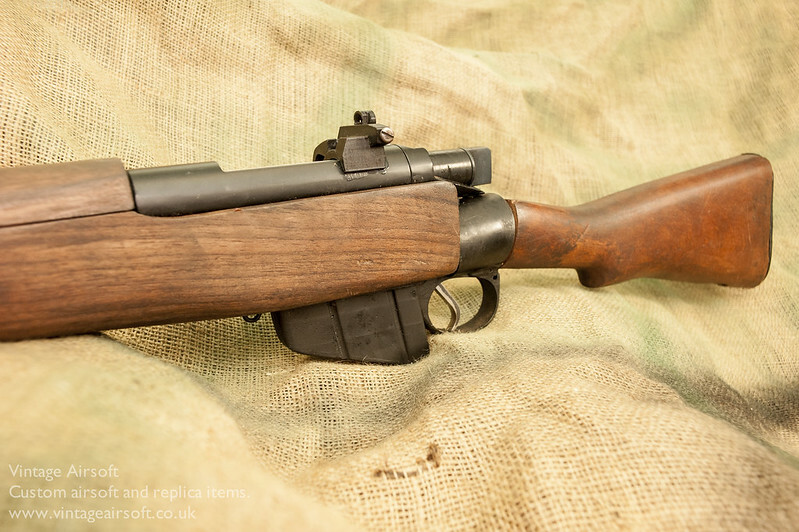 The first item on the agenda was to modify the bolt-action. I used a VSR as the base gun as it has many options for upgrades available and isn’t dreadful to start with. I made this extension on the lathe, turned to the diameter of the bolt so that it fitted into the action. In this I cut a slot at the front so that the out of battery safety can be operated when the bolt is turned. As you can see I have also made a backstop to prevent this extension from pulling back over the securing bolt. Then I cut a piece of steel bar and bent it to shape. I produced a rough ball on the lathe with a hole through the centre and hammered it onto the steel bar to a friction fit. This unit was then welded onto the extension. I had already designed the magwell unit to screw straight onto an unmodified VSR action. 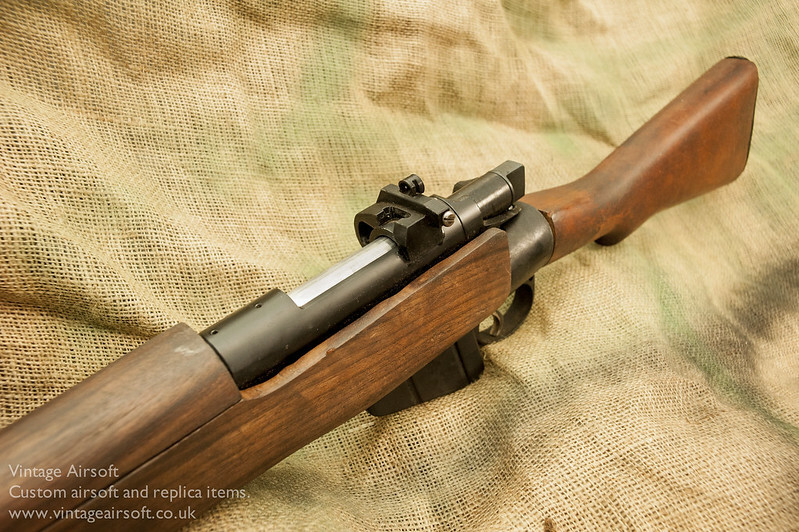 I have seen airsoft Enfields which just have a wooden magwell and found these tend to swell and shrink with moisture and temperature, gripping the magazine and making it difficult or impossible to remove during a firefight. Finished and in place on the action. The big spring locks the magazine in. Getting the action to fit the stock took quite a lot of work due to the shapes involved, so I shall skip to the stage where it is fitted. 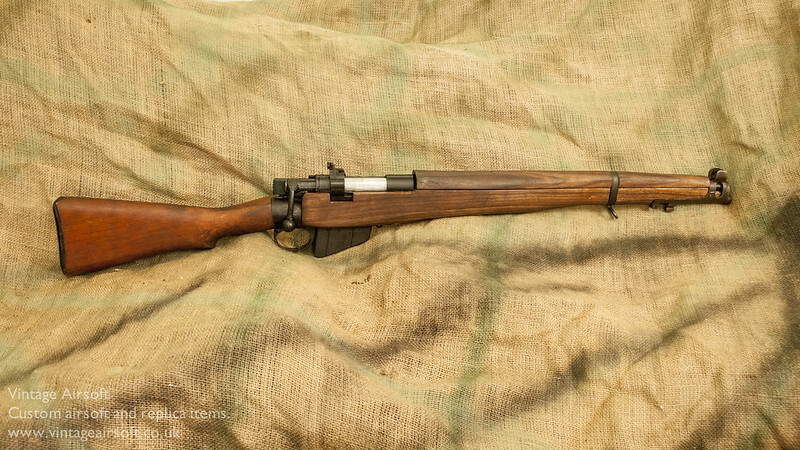 I am making this stock from scratch rather than trying to lever the VSR into a real SMLE stock as a real forestock is expensive and frankly a bit small to take this action very well. It can be done but it leaves the wood paper-thin at some points. This is walnut so is ideal for gunstocks and can be tailored for this action. Initially, this is cut a little deep but this is fixed later on. I planed it down a little and roughly fitted the nose cap into place-rounding off the fore-end a bit. Once planed down to size it is much easier to reach the magazine! I also started to fit the trigger guard at this stage, this will have the rear band attachment for the buttstock attached. A side view, so you can see where the band will be going now. OK, I confess, I forgot to photograph the band being made! It’s all coming together now, shaping the wood stock being the main priority, then making the rear sight, foresight and top guard.